The Bishops of The Society are delighted to support the launch of the Here I Am initiative. Bishop Tony Robinson, the Chairman of the Council of Bishops said, "We are very aware that the Church constantly needs more people called to serve the sacred priesthood. We hope this new campaign using up to date digital media will encourage more vocations." Here I Am is the title of the campaign which has the backing of the catholic societies of the Church of England with the full support of the Additional Curates Society. 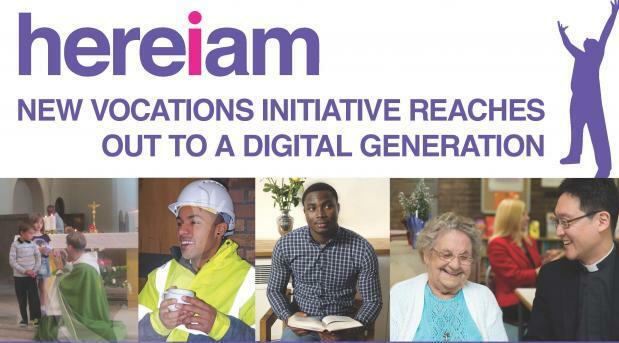 Those responsible have embraced digital media to encourage people to explore a vocation to priesthood alongside other kinds of ministry in the Church of England and the Church in Wales. A new You Tube channel features specially commissioned films looking at how people are called to ministry, what the selection process involves as well as examining the kind of people who are called to follow a path to priesthood. The Archbishop of Canterbury, Justin Welby, has backed the initiative: “I am delighted to see the Catholic Societies working together in order to promote and encourage more vocations to the sacred priesthood under this new and exciting banner of Here I Am”. A new Twitter account @hereiamvocation will be launched at the same time. Organisers hope that people will follow the initiative and join in a wave of prayer for vocations. Bishops and priests representing the catholic societies are already working in every part of England and Wales and it was felt that material that had served them well previously was ready for an upgrade to reflect where the digital audience can now be found. “We are excited and expectant about the future of ministry and mission in anglican catholic churches and communities,” Fr. Smith explained.